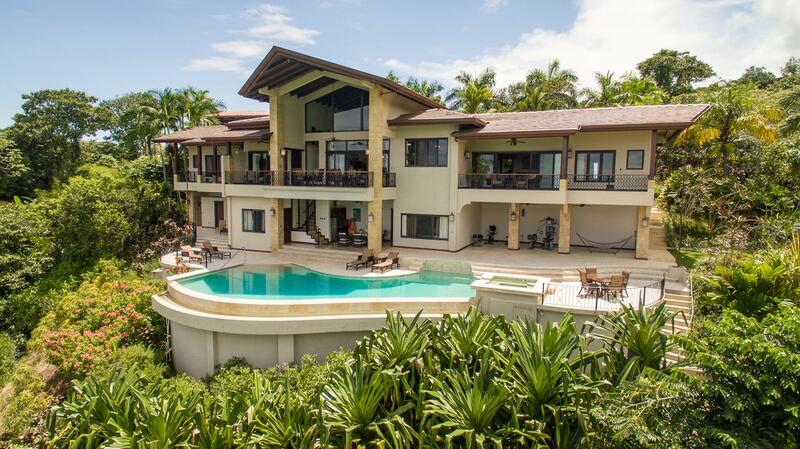 This luxurious 6,243 square foot home offers some of the best views in Southern Costa Rica. From your outdoor terrace, you can see lush jungle views, beautiful ocean views, and views of the whales playing and mating. This high-end luxury home includes a large patio with a pool and spa, exotic stone kitchen countertops, and high-quality wooden furniture. This home is perfect for your next family home or if you’re looking for a vacation rental. This 2018 custom built house includes both practical and luxurious finishing. It’s insulated well with Durock flooring upstairs and block flooring underneath downstairs. Beautiful Turkish travertine flooring and tiles accent the house. A variety of ceiling fans, windows and door walls work to circulate the gentle outdoor breezes and keep the indoors cool as well. This luxury home includes fine wood furnishings throughout the eat-in kitchen and living room. The open floor plan allows easy access to each part and makes it easier for to communicate with family members. The gourmet kitchen features stainless steel appliances, cedarwood cabinetry, and exotic stone countertops and a Kitchen Island. Cushioned bar stools help with extra seating. It also includes a round Teak wooden kitchen table and chairs. All of the wood chairs, the coffee table, and the bench were crafted out of Teak. The living room features two white couches and a large flat screen TV so you can relax comfortably. An eight-foot sandstone carving accents the wall. This luxury home features four luxurious bedrooms. The master bedroom is on the first floor and features a king-sized bed and a handcrafted wood headboard. The door wall opens right up to the patio. The master bath features Turkish vein cut travertine tiles on the walls. It also includes double stone vessel sinks and a luxurious Jacuzzi tub. The second master bedroom is located upstairs features its own luxurious bathroom with an amazing balcony looking to the Pacific Ocean. The other two bedrooms are up a flight of wooden stairs. At the top of the stairs, there is a stunning wooden cabinet with another sandstone carving on it. Each of the additional bedrooms also includes hand-crafted wooden furniture, end tables, a reading chair, and an ensuite bathroom. However, these two bathrooms feature an indoor bathroom and an outdoor shower on your private terrace area. You’ll have stunning views of the amazing canopy of trees from the outdoor tiled shower. The large private terrace includes Castelli wicker outdoor furniture, including sofas and chairs. The outdoor entertaining area is one of our favorite parts of the house. It features a plunge pool, constructed from Sukabumi pool tiles. The outdoor Spa was made locally from white marble. Comfortable loungers surround the pool area. The patio features an outdoor BBQ grill, an outdoor bar area, and a Guanacaste wooden dining table. In addition, you’ll find a covered patio table and chairs, and outdoor sofas. This makes it ideal for cooking dining outdoors on warm nights or hosting pool parties. This luxury home is part of Selva Pacifica, an 11-lot gated community in development. This will allow you to feel safe and secure among a smaller close-knit community. It’s been built with high –quality materials, including six inches of concrete for the driveway. You have access to a cement rood for around 60 percent of the trip to nearby areas, like downtown Uvita and Playa Dominical. Being only minutes away gives you access to multiple activities in both areas.